In 2014 we took on the maintenance of the 'Twizzle' bed which is located just opposite the library on the pathway through to Long Street. Up to that time it had been created and maintained by a resident of Close Gardens. 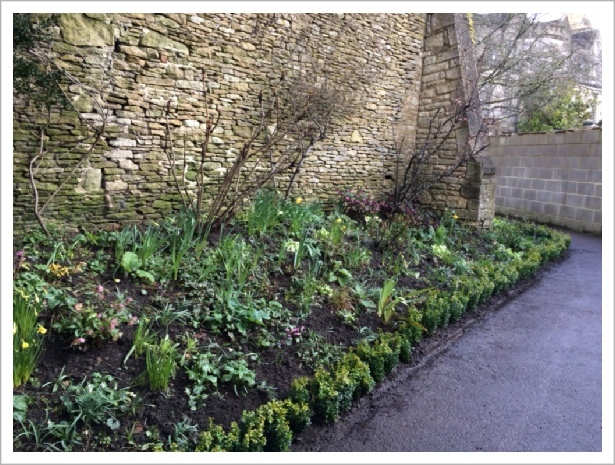 Our aim has been to establish an informal but well cared for looking bed filled with a colourful array of spring bulbs - snowdrops, crocus, grape hyacinth, cyclamen, hellebores and the smaller varieties of daffodils and narcissi. For the summer months we’ve planted more perennials such as heuchera, small leaved bergenia, cranesbill and hypericum. It’s certainly not the easiest of beds to work on with it being located on a very steep slope and at least half of the bed is shaded by a very large evergreen tree which makes choosing suitable plants more difficult. In an effort to stop the soil drifting down onto the path, in 2018 we planted a small box hedge along the front. This not only achieved our object of keeping the soil back, but it transformed the look of the bed and gave it a real ‘cared for’ appearance.